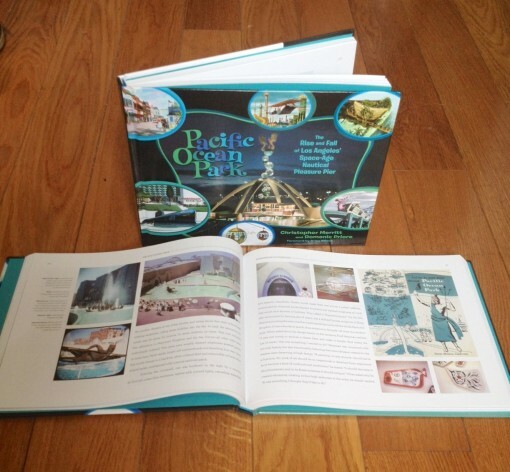 Our copies of the meticulously written and beautifully designed Pacific Ocean Park: The Rise and Fall of Los Angeles’ Space Age Nautical Pleasure Pier, with a foreword by Brian Wilson, have arrived! The authors Christopher Merritt and Domenic Priore are doing a few very special events over the next week in New York and Los Angeles. Chris is flying all the way from Shanghai, where he is currently helping to design and build a large amusement park, and this will be the ONLY chance to get his signature on the book and to see him give a presentation and slideshow of the park. He and Domenic will be presenting a ton a fascinating information and engaging photographs from this long forgotten institute of human pleasure. Check out the video trailer for the book to see some great footage and learn more about the park. You can also read more about it in last week’s New York Times.